The Murder of Roger Ackroyd by Agatha Christie is told from the perspective of James Sheppard, a surgeon living in King’s Abbott, England. Although he first meets Roger Ackroyd at a dinner in Fernly Park, Sheppard has known for years about Roger’s family troubles. His stepson Ralph Paton, somewhat of a prodigal son, is engaged to be married to Flora Ackroyd, the daughter of Roger’s sister-in-law. At the start of the novel, Sheppard learns of the death of Mrs. Ferrars, a widow who rumor claimed had killed her first husband. Roger had been engaged to marry this woman. After the dinner, Roger Ackroyd invites James Sheppard to his study and informs him that Mrs. Ferrars had been blackmailed by someone for the alleged murder of her husband. Roger suggests that the blackmailer is responsible for the woman’s death. Parker, Roger’s butler, enters the study and hands Roger a letter which the latter opens but doesn’t read. As Dr. Sheppard is returning home, he runs into a man who asks Sheppard for directions to a nearby village. Although the doctor does not recognize the stranger, he thinks he has heard his voice before. Hours later, he receives an alarming phone call from Parker. Roger Ackroyd has been murdered. Dr. Sheppard grabs his large black medical bag and rushes over to the Ackroyd establishment . Parker denies having called the doctor, but Sheppard knows what he heard over the phone. Upon breaking open the door to Roger’s study, Dr. Sheppard finds Roger Ackroyd dead as expected, a large knife lodged in his back. The police interview all of the people Roger knew in his last days. Parker, Ralph Paton, and Geoffrey Raymond are all promising suspects, but Flora Ackroyd doesn’t trust the investigators. She hires Hercule Poirot, Dr. Sheppard’ next-door neighbor and an acclaimed private detective, to identify Roger’s murderer. Poirot accepts the appointment and asks Dr. Sheppard to accompany him in his investigation. Sheppard reminds Poirot so much of his assistant Captain Hastings. The Murder of Roger Ackroyd is rightly considered one of the greatest murder mysteries ever written. I have read many Hercule Poirot mysteries in my day, but The Murder of Roger Ackroyd stands out from the rest of Agatha Christie’s books for its ingenuity and craftsmanship. If you have never read anything by Christie, I don’t recommend you start with this one. Death in the Air, Hercule Poirot’s Christmas, or even Murder on the Orient Express would serve as better introductions. Because of its uniqueness, The Murder of Roger Ackroyd is also one of Christie’s most controversial works. It is better to start with one of her least ambitious works lest you turn out to be disappointed by this one. Dr. James Sheppard has a sister named Caroline Sheppard who is the busybody of King’s Abbott. She knows everyone’s business and is not afraid to speak her mind. Dr. Sheppard’s sarcastic remarks are lost on his sister, but they add a touch of humor to an otherwise dark story. It is no secret that I prefer Hercule Poirot to Sherlock Holmes. Poirot, an avid gardener with a well-formed mustache and an egg-shaped head, is quite a memorable investigator. And of course, everyone is a red herring; the reader is left guessing until the very last chapter (unless you are me and you accidentally spoil the mystery for yourself while only part way through the book). 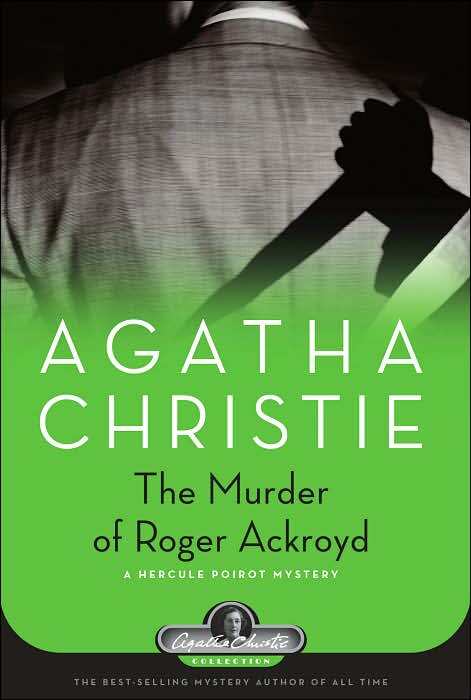 If there is one Christie book I would like to reread it is The Murder of Roger Ackroyd. Even though I knew the ending, I would never have predicted it. Agatha Christie is like a magician whose tricks I want to understand because they are so ingenious.